The Minimum Wage in the State of Vermont is a minimum wage law poster by the Vermont Department Of Labor. This is a mandatory posting for all employers in Vermont, and businesses who fail to comply may be subject to fines or sanctions. This poster must be posted in a conspicuous place by all employers so that all employees can see it. This poster describes what the minimum wage is for tipped and untipped employees. It appears you don't have a PDF plugin for this browser. 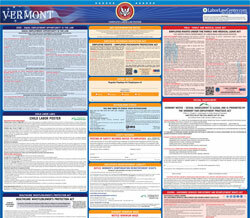 Please see the link below to download vermont-minimum-wage-poster.pdf. more than $120.00 a month in tips for direct and personal customer service. contribution towards the minimum wage for service or tipped employees. the employer must make up the difference. not seasonally adjusted, whichever is smaller.